Some great names have been suggested. I’m particularly fond of Edna, Ethel and Maude. But you know what? I may just end up calling her Pinky – I uttered that name spontaneously as I was working on her tonight. Has the right sort of feel and fits my personality too. I took her apart again tonight and fixed two issues, one with the needle position selector and one with the decorative stitch selection knob. And I did a little research and joined a Yahoo group devoted to vintage Japanese machines. You see, when you turn the sewing machine over, all of its parts that bear markings are stamped with the named “Brother” for the Brother Sewing Machine Company (f/k/a Yasui Sewing Machine Company). Turns out, it was fairly common in the late 50s and early 60s for Japanese sewing machine manufacturers to make machines and export them into the US where they were “badged” with other names, presumably to appeal to the tastes and prejudices of the American consumer. Atlas was just one of the badged names used on Brother machines. So this machine is really a Brother JC1 “Select-O-Matic” machine – try Googling that name for a brief trip back to the 50s. Turns out a lot of people liked to name their equipment “Select-O-Matic.” Anyway, I oiled the old girl in all her squeaky joints and she is sewing as well as she ever has. Now I will turn to some fine detail cleaning when I get the chance. I need to pick up a bottle of rubbing alcohol and some Q-tips to clean out some of the dirt, and I am going to replace two of the belts and all of those things should make a real difference. Here she is, in all of her mid-century pink glory. Well, she wasn’t mine actually, not until now anyway. 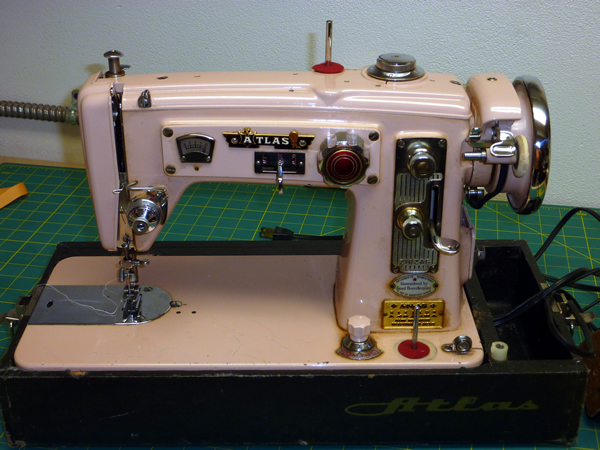 This was my mom’s sewing machine, the first sewing machine that I learned to sew on. It’s an Atlas model from either the late 50s or the early 60s. Mom’s had it as long as I’ve been around, and she never has been able to sew on it. I, however, have never had any problem. Mom gave me her old machine when we were visiting in Florida and we got it shipped up here. The case took a beating in the shipping and the wood broke in a few places, but it’s still usable. The machine, however, is built like a tank and it would take one to do any damage. I started cleaning her up last night and was able to thread the machine and she still sews quite a nice straight stitch. I was thinking last night, I need to make something for mom on “her” machine and send it to her as a surprise. Haven’t quite figure out what yet. I think we should have a naming competition and give her a name. My car is named Dotty, so we can’t use that one. Peggy? Doris? Eileen? Come on, give me your best shot. Well, it has been a long time since I posted anything on my blog, hasn’t it?! We were gone to Florida for a couple of weeks visiting my mom, and we got back last week and are just now settling back into normal. I thought I would share a few pictures from our Florida trip, cause I know some of you are in serious withdrawal. (Linda, are you listening?) Juliette started walking at mom’s house in Florida, and she is unstoppable now!